Hypertension and chronic kidney disease (CKD) have a significant impact on global morbidity and mortality. The Low Birth Weight and Nephron Number Working Group has prepared a consensus document aimed to address the relatively neglected issue for the developmental programming of hypertension and CKD. It emerged from a workshop held on April 2, 2016, including eminent internationally recognized experts in the field of obstetrics, neonatology, and nephrology. Through multidisciplinary engagement, the goal of the workshop was to highlight the association between fetal and childhood development and an increased risk of adult diseases, focusing on hypertension and CKD, and to suggest possible practical solutions for the future. The recommendations for action of the consensus workshop are the results of combined clinical experience, shared research expertise, and a review of the literature. 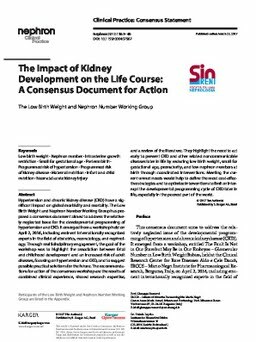 They highlight the need to act early to prevent CKD and other related noncommunicable diseases later in life by reducing low birth weight, small for gestational age, prematurity, and low nephron numbers at birth through coordinated interventions. Meeting the current unmet needs would help to define the most cost-effective strategies and to optimize interventions to limit or interrupt the developmental programming cycle of CKD later in life, especially in the poorest part of the world.